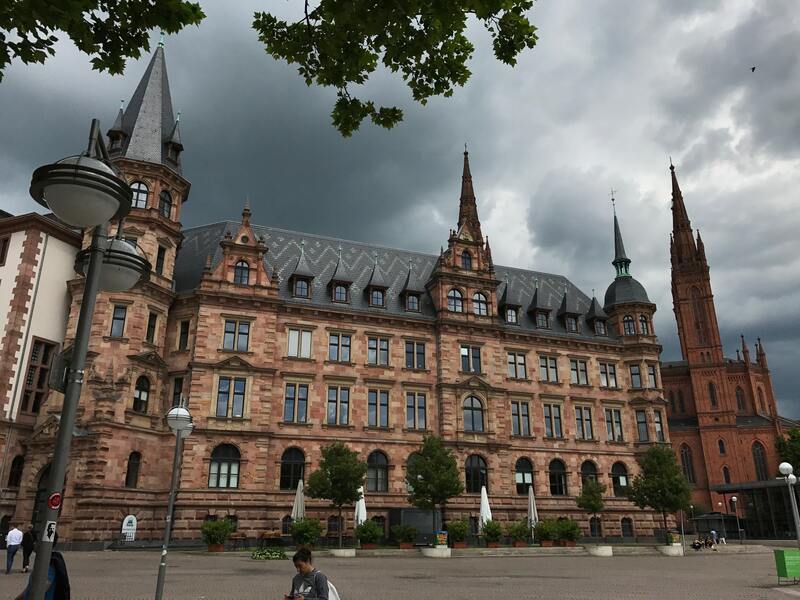 Just 40 kilometers west of the vibrant financial metropolis Frankfurt am Main we find the more dapper or let’s say tranquil hessian state capital Wiesbaden. 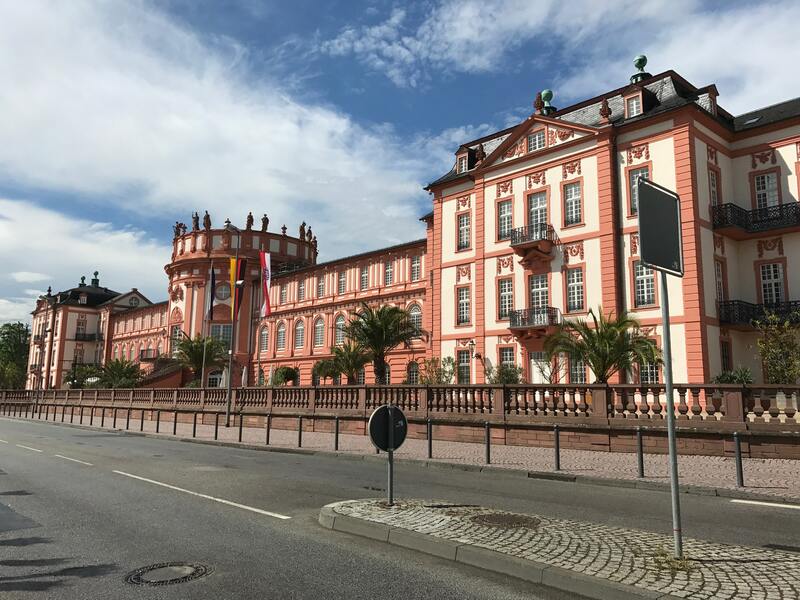 Wiesbaden has already been famous as a spa town in roman times because of its hot springs and the “Nice of the north”, as Wiesbaden is sometimes referred to, has been visited by Emperor Friedrich Wilhelm II on a regular basis. A few imposing building remind you of that time like the Kurhaus and the hessian state theatre as well as the Casino, where amongst others, Fjodor Dostojewski lost his rubles. 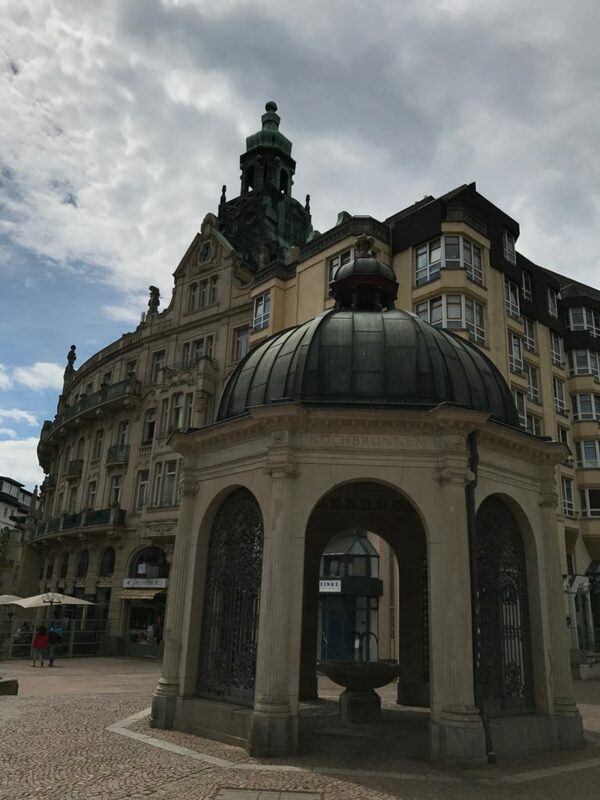 So there is a lot to discover in that beautiful town in the heart of Hesse and you will find here a selection of the sights of Wiesbaden. We start our day from Motel One again which is located right next to the main train station in Wiesbaden. From here we can either take an approximately 20 minute walk into town through Bahnhofstrasse, passing the conference hall called Rhein-Main Hallen, or we just use the bus (number 1 or 8) that stops right in front of the hotel and drives straight into down town in only 5 minutes or less. No matter if you walk or ride the bus our first sight the town hall of Wiesbaden and the Schlossplatz. Around the Schlossplatz we find four sights. The new town hall (Rathaus), that will catch your eye first because of its red colour, the Marktkirche, the Hessischer Landtag and the old town hall. Across from the new townhall is the former city castle that nowadays hosts the hessian state parliament and is called Hessischer Landtag. The old townhall, the oldest building down town, is located on the left side of the Schlossplatz. On wednesdays and saturdays there is a colorful farmers market on the Schlossplatz and around the new townhall, where we can witness the loud and slightly hectic trading of the farmes while enjoying a nice and cold glass of sparkling wine (sparkling wine is called Sekt). Since we feel a little appetite rising after our glass of Sekt we got to the Andechser restaurant that is situated in the Ratskeller of the new townhall. Here we strengthen ourselves with hefty but simple traditional meals accompanied by a glass of Klosterbier (monastery beer) or some local wine. Well strengthened we take up our walking passing the world largest Kuckuck-clock towards Wilhelmstrasse, which is Wiesbadens shopping area for the well-situated customers. 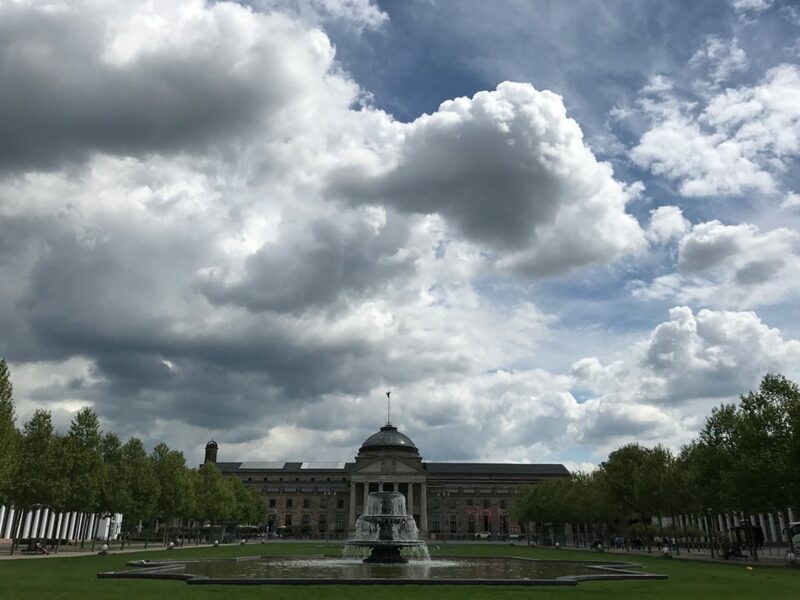 As soon as we cross the “Rue“, as the locals call Wilhelmstrasse sometimes, we find ourselves in front of the imposing Kurhaus. The Kurhaus hosts events on a regular basis, like the Ballnacht der AIDS-Hilfe in December, which is one of the most colorful and fancy spectacle you will ever witness. Insinde the Kurhaus you will also find the casino called Großes Spiel. There are strict rules regarding the dress code to get into the casion though, which is why we pass the casino and leave the Kurhaus on the other side walking straight into the Kurpark. In summer we recommend a little break to enjoy a cold drink and recharge your batteries in the sun at Käfer’s, located just behind the Kurhaus and a little way from hectic downtown. On the way back to the old part of down town Wiesbaden we walk through the colonnades of the hessian state theatre. Here you should check the program, especially in May since there is the famous Mai-Festspiele, a theatre festival going on. 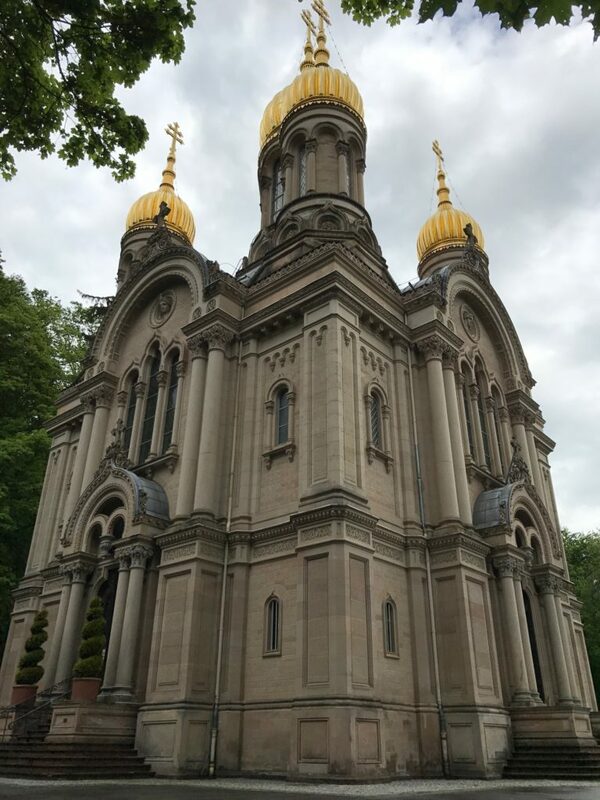 We stroll through down town Wiesbaden towards the Neroberg. Before reaching the Neroberg we pass the Kranzplatz and another special characteristic of Wiesbaden: its hot springs. In roman times Wiesbaden has already been famous for its natural hot springs and also today you might hear people say that the heavily mineral-bearing water is supposed to have a positive effect on the body. The strong sulfurous smell of the 67°C hot water coming out of the Kochbrunnen discourages us from actually trying it ourselves. So we leave down town behind us and walk along Taunusstrasse towards Nerotal. At the end of Nerotal the Neroberg is awaiting us. 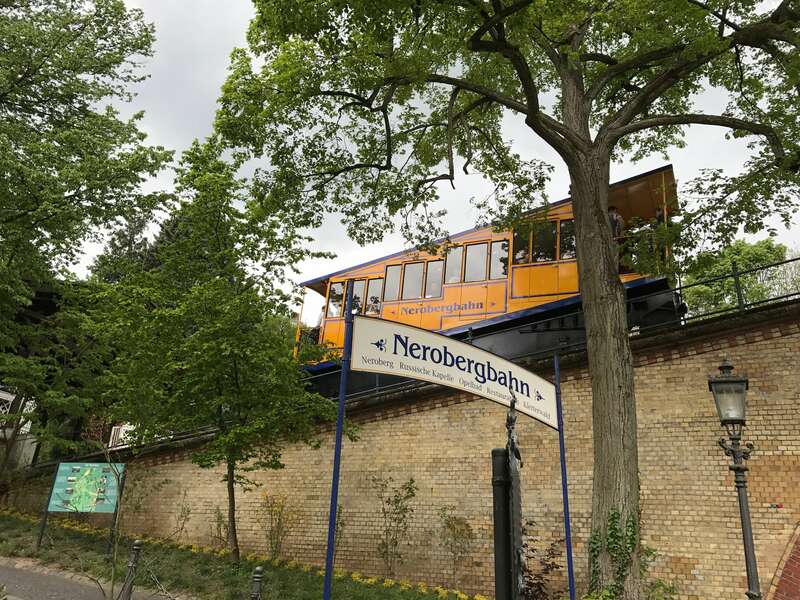 It is possible to hike up that hill in about 45 minutes but we decide to use the Nerobergbahn that was first opened in 1888 using its unique water-ballast-technology to bring people up the hill that has not changed since 1888. The loud sound water of the released water on the foot of the hill surely is impressive. 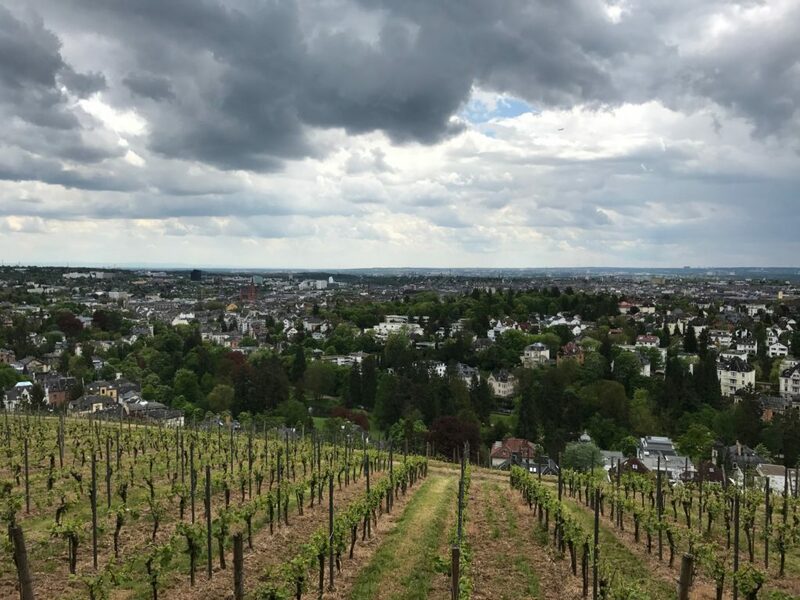 Once we reach the top we slow down and enjoy the great view over Wiesbaden. On a hot summer day we recommend a visit to the outdoor swimming pool Opelbad, embedded in vineyards, you can swim and enjoy that great view at the same time. On our way back down we walk by the Russian-orthodox church call Russisch Orthodoxe Kirche that is sometimes referred to as “Griechische Kapelle”. 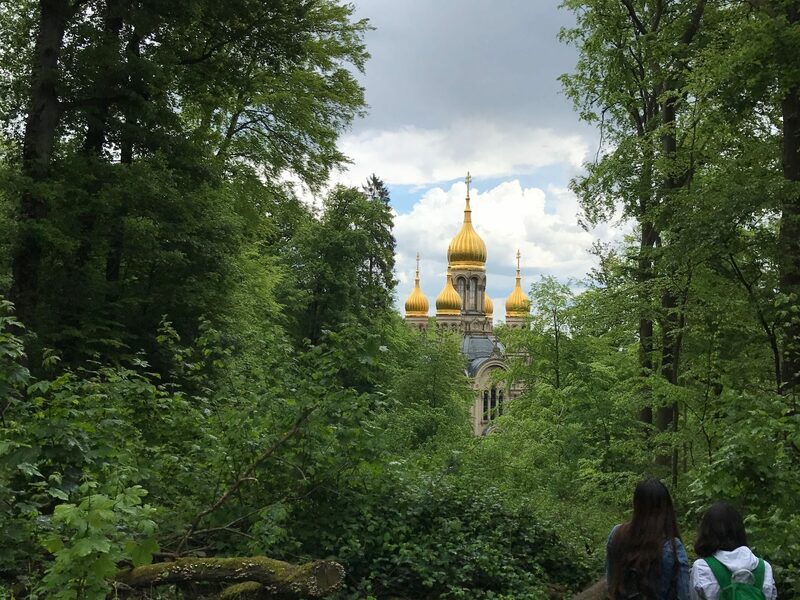 The five golden onion shaped towers of the basilica built in for the deceased Russian princess Elisabeth Michailovna, daughter of Michael Romanov, are visible from multiple spots throughout Wiesbaden and probably one of the most-photographed sights in and around Wiesbaden. 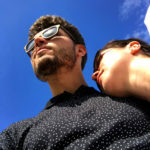 Since we are getting really hungry we go back to down town where we choose one of the many restaurant options on Goldgasse to let the day fade away. Goldgasse is part of the Bermuda-Triangle which lives up to its name, because after a good dinner it is easy to get stuck with a good wine in one of the bars in that area. The Biebricher Castle is little further away from down town and situated directly on the Rhine River. Beyond the Castle there is a big park named Schlosspark that is well known amongst equestrians because of the annual International Pfingst-Turnier but is used for sunday walks the rest of the year. Around pentecost though you will find the elite of equestrians and the main part of the park is closed for the event. We take a little walk on the riverbank towards the sunset and enjoy some ice cream from the Eisdiele am Rhein. On a hot day it can be quite an ordeal to get some ice cream since the line can be extremely long. A good alternative to the route by foot is to take the little town train THermine. It is a little train on wheels that drives to all the sights in Wiesbaden and works a little bit like a hop-on/hop-off bus. Tickets and more information are available from the tourist information that is located on the Schlossplatz just behind the new town hall. With these manifold impressions we leave the beautiful state capital of Hesse.